This was my capstone Project as a Masters candidate in the HCI program at Georgia Tech. The goal was to build a context based experience for reading complex narratives. 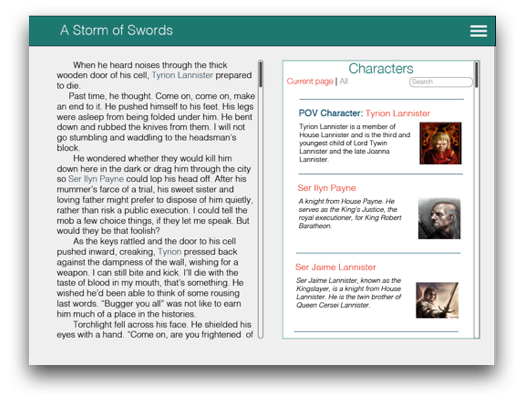 Considering the worldwide popularity of Game of Thrones, I chose its source material A Song of Ice and Fire as the subject for this project. Stories and narratives are an integral part of our lives, for education and for entertainment. I grew up in a family that reads at dinner tables and books have always been a huge part of my life. My brother and I have lived in separate cities and countries for 10 years now, but we still manage to share books because of the advent of technology and discuss specific characters and plot points. On digging deeper, I found some of these amazing numbers around e-books and e-readers, and how these numbers are continuing to grow with each year. However, most of these readers provide the books in the form of static content. With the exception of a few children’s books, they have not leveraged the technology available to make these books interactive. I wanted to explore the idea of an application to provide contextual information while reading. Initially I wanted to work with the 'Mahabharata', a complex Indian epic known for it's multitude characters and their weaving storylines. However, after further discussions with my mentor, I chose 'A Song of Ice and Fire' as my subject for the exploration since it would be easier to gain access to test participants for the series. Three predominant stories interweave in this complex plot, the story traveling to multiple locations across the map. Each chapter of the story follows a particular character and narrates the story from their perspective. There are multiple characters gaining and losing importance as the story progresses and their changing allegiances increases the richness of the story. As the story has progressed, it has become difficult to keep track of the multitude of characters. The HBO show 'Game of Thrones' based on the story deviates from the books significantly, contributing to this. While there are different devices available for the purpose of reading such as the Kindle and Nook, most of these devices do not provide any interactive features or enhancements. I conducted a competitive analysis to understand the gaps in the current market, and to understand what my prototype should aim to address. The X-Ray feature on Kindles lets you explore the "bones" of the book. For example, you can see all of the passages in a book that mention specific ideas, fictional characters, historical figures, and places or topics. This is the official companion app for the books, to help readers get character bios and spoiler free information. To move forward with the design process, it was imperative to analyze the users and find their requirements. After I analyzed the survey results, I conducted 5 interviews with participants who were familiar with A song of Ice and Fire series and had read them. These interviews helped me gain a deeper understanding of user behavior. Most users described two modes while reading: the Reading Mode and the Analytical Mode. For most readers, wikis were needed to remember characters. While reading, checking quick facts about characters to refresh their history was necessary. Readers mentioned getting distracted from reading due to the use of wikis. Users described ‘Wiki Walks’, going from link to link and losing the page where they started from. Readers also wanted a clearer understanding of the family trees of characters. The places mentioned in the books are fictitious. As such, readers had trouble orienting themselves on the maps of these worlds. Many of the participants watched the television series and said that they had higher retention of faces than of names. Once I had a list of requirements and considerations ready, I moved on to the design phase. The focus of the design was a glance-able guide to story elements, and a way to provide contextual information about story elements which updates based on reader's knowledge. These are some of my initial sketches, when I was generating as many concepts as possible. My next series of explorations focussed on the two modes from the interviews I had conducted. This project is very close to heart, since I love reading and collecting books. I want to continue working on different aspects on making books interactive because I feel that books can be made so much more interactive with the technology available to us. As a side project, I'm currently working on concepts for an interactive children's book around Indian mythology. With its colorful characters and symbolic representations, it provides a vast and interesting topic to explore and allows me to revisit my own childhood.